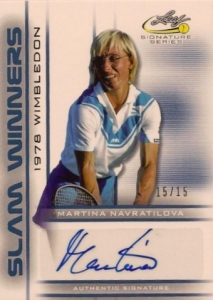 Continuing their string of tennis card releases over the years, the 2017 Leaf Signature Series Tennis checklist skews to the all-time greats of the sport. 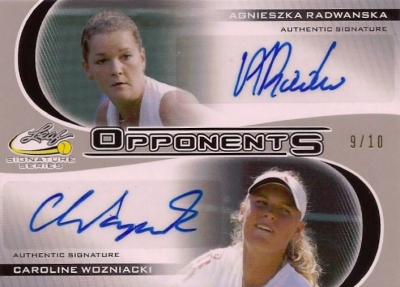 Featuring current and former legends of the game, like Roger Federer and Pete Sampras, every box contains 10 autographs. 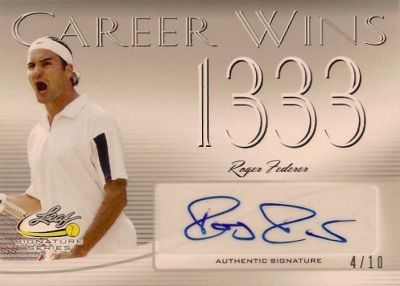 While there are multiple themed inserts, such as Career Wins, National Pride, Peak Performance and even multi-player Opponents cards, collectors will find only signed editions in 2017 Leaf Signature Series Tennis. Like most Leaf sets, there is also a colorful selection of low-numbered parallels. Among the names that fill the product are some of tennis' truly elite players and many of these also act as case hits. More specifically, Federer and Sampras autographs are expected in each case, along with signed cards for Andy Murray, Kim Clijsters, and Serena Williams. In addition, every case includes a Hot Box that only has autograph parallel cards. With less than 150 cases available, 2017 Leaf Signature Series Tennis has limited production. Roger Federer Auto Tennis Card 2 Graded MINT 9!! 2016 Metal Leaf 20 Slams!GOAT! 61 cards. Shop on eBay. PARALLEL CARDS: Silver #/25, Blue #/15, Green #/10, Red #/5, Gold 1/1, Plates 1/1. CLIJSTERS PARALLELS*: Silver #/15, Blue #/10, Green #/5, Red #/3, Gold 1/1, Plates 1/1. FEDERER PARALLELS*: Silver #/10, Blue #/5, Green #/3, Red #/2, Gold 1/1, Plates 1/1. SERENA WILLIAMS PARALLELS*: Silver #/10, Blue #/7, Green #/5, Red #/3, Gold 1/1, Plates 1/1. 6 cards. Shop on eBay. 11 cards. Shop on eBay. 13 cards. Shop on eBay. PARALLEL CARDS: Silver #/25 or less, Blue #/15 or less, Green #/10 or less, Red #/5 or less, Gold 1/1, Plates 1/1. See the full spreadsheet for specific parallel print runs. I love this product! 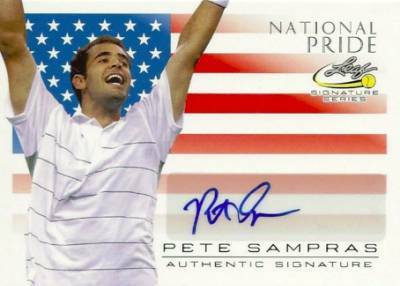 Last night I was lucky enough to hit a National Pride Pete Sampras Gold 1/1! He was one of my idols growing up in the sport absolutely love the card! Was just wondering the value of a card like that? Regards, Trent Koers, Melbourne, Australia.